An infection with the dangerous .djvu ransomware virus leads to serious security issues. With our removal guide, victims can try to secure their computers and restore encrypted files. Skip all steps and download anti-malware tool that will safely scan and clean all harmful files it detects on your PC. In case that your Mac has been affected by .djvu Ransomware or you suspect that other threats are running on it you can follow detailed instructions on how to detect and remove Mac viruses so you can keep the device clean and secure. .djvu crypto virus is a devastating data locker ransomware that has been recently released in attack campaigns against computer users worldwide. Threat actors could be utilizing widely used tactics of distribution to infect computer systems. One of the methods that may be used by the malicious actors behind .djvu crypto virus include the coordination of SPAM email messages — they are used to spread the threat by sending out messages that pose as legitimate notifications sent by popular Internet portals or services that the targets may use. The virus files can be either directly attached or linked in the body. They can also be uploaded to fake download sites which are designed to appear like any of the popular Internet portals or vendor download sites. The malicious actors may use similar sounding domain names, certificates and hijacked design and contents to coerce the victims into thinking that they are accessing the legitimate address. Another way that the threat may spread is through infected payloads — the use of various files that are infected with virus code. A popular example is the malicious document which can take any form: presentations, rich text files, spreadsheets and databases. Once they are opened by the victims a notification message will pop-up asking the target users to enable the built-in scripts. If this is done the virus infection will follow. The other popular technique is the inclusion of the code in application installers. They are malicious copies of legitimate setup files of popular end-user programs that have been modified with the .djvu ransomware code. Ransomware files are also popularly spread by fake user profiles — they can post to community forums or social media accounts. The criminals can utilize both fake or stolen identities to increase the number of infected users. In certain cases, the criminals may also be distributed via malicious browser plugins — additions to the most popular web browsers that are advertised as useful. The plugins are uploaded to the official repositories and often make use of fake or hijacked user reviews and developer credentials. Once they are installed by the users they will execute their built-in instructions that in many cases leads to the .djvu ransomware virus infection in the end. The .djvu ransomware virus is a threat that infiltrates computer systems with the purpose to encrypt certain types of files. This devastating impact is misused by hackers that extort a ransom payment from infected users. When first executed on a target system, .djvu ransomware virus scans the system for particular security mechanisms in an attempt to evade detection and continue with its malicious activities. Following this phase, it establishes more malware files on the system. This is possible either by their direct creation on the system or by their download from a remote server. With the help of these files, .djvu crypto virus becomes able to complete all infection stages which eventually enables hackers to extort a ransom fee for the decryption of corrupted files. While infecting the system this ransomware could access some of the essential system components like the Registry Editor. By doing this it aims two things – persistent presence on the infected system and launch of its ransom message. In order to achieve these two things, .djvu needs to add malicious values under specific registry sub-keys – Run and RunOnce. Both keys manage the automatic execution of all files and processes listed under them. 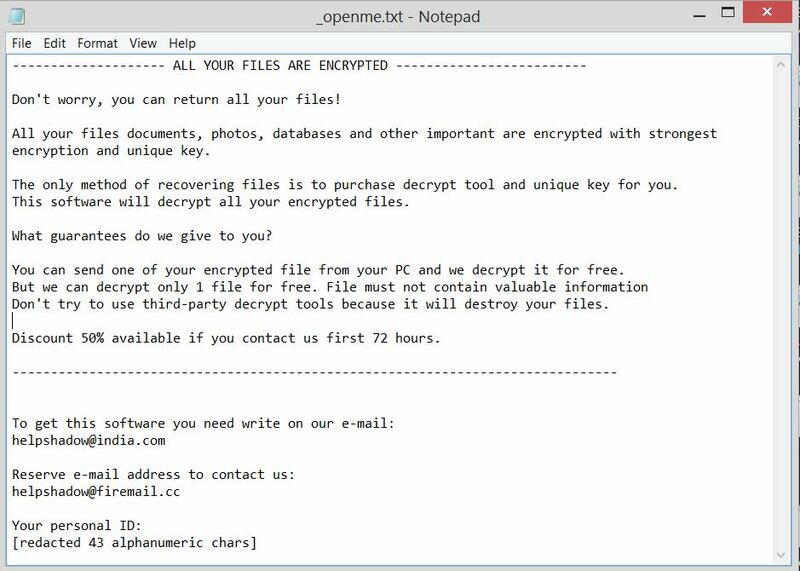 So once plagued the registry sub-key Run triggers ransomware files on each system start while RunOnce cause the appearance of a file called _openme.txt. This text file is dropped by .djvu crypto virus soon after all target files are encrypted. As of target files, they all may be of commonly used types so that you can lose the access to valuable data. This is a result of the usage of sophisticated cipher algorithm that applies heavy modifications to the original code of target files. Following encryption, corrupted files are marked with the extension .djvu. What guarantees do we give to you? Don’t try to use third-party decrypt tools because it will destroy your files. Discount 50% available if you contact us first 72 hours. Our advice is to refrain from following cyber criminals’ instructions as this could lead to further losses. Please note that paying the requested ransom fee to cyber criminals does not really solve your problem with .djvu crypto virus. In fact, you only encourage hackers to continue spreading ransomware of this kind. Instead, you must remove the threat immediately, and only then look for optional ways to recover your data. WARNING! Manual removal of .djvu Ransomware ransomware virus requires being familiar with system files and registries. Removing important data accidentally can lead to permanent system damage. If you don’t feel comfortable with manual instructions, download a powerful anti-malware tool that will scan your system for malware and clean it safely for you. This will isolate all files and objects created by the ransomware so they will be removed efficiently. The steps below are applicable to all Windows versions. WARNING! All files and objects associated with .djvu Ransomware ransomware virus should be removed from the infected PC before any data recovery attempts. Otherwise the virus may encrypt restored files. Furthermore, a backup of all encrypted files stored on external media is highly recommendable. Gergana Ivanova is computer security enthusiast who enjoys presenting the latest issues related to cyber security.